Feature: In the mid 90s traditional Hong Kong action movies were still an underground and not exceptionally popular genre outside o fit snative country, much like anime was at the time. With the recent mainstream success of more westernised Hong Kong movies like Crouching Tiger Hidden Dragon, the mainstream interest in asian cinema has increased exponentially. I must confess I wasn't a huge fan of Crouching Tiger as it muted and toned down a lot of what makes traditional Hong Kong martial arts movies great to make it more "hollywood" and therefore more accessible. It has made deserving stars of alot of previously unnoticed acting talent, but one mustn't think that Crouching Tiger is the be all end all martial arts movie. 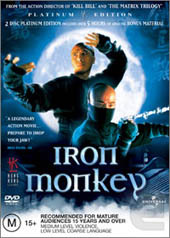 Iron Monkey was made in 1993, as a prequel of sorts to the Once Upon A Time In China series that Jet Li made popular. It's place in martial arts movie history should not be undervalued as its an absoloutely fantastic piece of true martial arts cinema. It treads the same kind off familiar territory to many other movies of the genre, but has a wonderful combination of the traditional old school era kung fu movies of the 70s made famous by Jackie Chan and Bruce Lee, and also combines this with the wire work and ballet like choreography of the more recent epics, like Hero and Crouching Tiger. Iron Monkey tells the tale of a Robin Hood type shaolin monk. He steals from the corrupt rich local govenrment and gives to the poor flood and plague ravaged people of the town. The simple morality play changes when a travelling hebalist/monk comes to town and his son is kidnapped and jailed until the new mysterious and powerful monk brings the Iron Monkey to justice. This is complicated further when rival shaolin monks are called in to put an end to Iron Monkey's antics. Is this plot corny? Yes. Does it offer anything new to the genre? No. What Iron Monkey does do is give you an incredible ride that easily ranks in the highest echelons of martial arts cinema. The simple morality plots of a lot of asian cinema don't need confusing plot twists and incredible story revelations to be entertaining. The set piece fights and battles in this movie are up there with the best. The story carries along and always keeps you entertained but kung fu cinema is about kung fu, and this delivers in spades. This is mainly due to the increidbly skilled cast of martial artists in the cast. Yu Rong Kwong plays the titular Iron Monkey with deft skill, he's like a combination of Chow Yun Fat and Jet Li, and his perofrmance is very entertaining. Donnie Yen (most recently in Hero) plays second lead as Wong Kei-Ying; he's made for these roles of the stronger more intense character and his fight scenes in Iron Monkey are up there with the best (if not the best) he's ever done. Special note must go to the females of Iron Monkey. Jean Wang plays a great companion for Yu Rong Kwong as Miss Orchid. Her performance is very convincing as his partner in kung fu, and as a herbalist. Special note must go to Sze-Man Tsang, the girl (yes, a girl) who plays a young Wong Fei-Hung (Jet Li's character in the Once Upon aTime in China series). Her martial arts skill is very impressive, and some of the rough treatment he/she is on the recieving end of certainly made me wince a few times. This was Sze-Man Tsang only movie role, and although it's a shame she hasn't performed since, it good to see her talents aren't by any means going to waste (see Extras section). All the things you either love or hate about kung fu movies are all present and correct in Iron Monkey. Over acting villains, familiar sound effects, dust clouds on every point of contact in fights, scenerey breaking in every shot, slapstick humour, and super human abilities. You either love this stuff or hate it, and Iron Monkey isn't going to change anyone's opinion of the genre. I do believe though that previously dismissive viewers could enjoy this a lot more than they would have thought when it was released, thanks to the genres more widespread acceptance in recent times. This is the martial arts movie in its most pure form, there isn't any pandoring to needless character development or forced love interest, or romantic tragedy to slow up the pace or try add faux complexity to the story. Its a simple morality play with absoloutely scintillating fight scenes that are worth admission price alone. The great performances by the cast are beautifully complemented by the amazing fight choreography by Woo-ping Yuen. Video: Honk Kong legends have lovingly transferred the 16:9 transfer of Iron Monkey very well. Aside from some light grain (more prominent in the night scenes) the picture is for the most part very sharp. The lavish, traditional interiors of the sets are incredibly detailled and are bursting with colour. The quick action sequences hold up just as well and never exhibit compression problems or anything else untoward. The close up shots of the actor's faces are also beautifully rendered. Its not often a film strikes as being a real feast for the eyes, but this is right up there with the best kung fu DVD releases. Well done Hong Kong Legends. Audio: A wealth of audio streams are present; two 5.1 Dolby Digital tracks (Cantonese and English) as well as a 6.1 DTS track in Cantonese. The tracks have had a lot of work done to them to make them work in 5.1 but they are all betrayed by the obviously stereo source material. The soudscape is very front loaded, and even the more obvious ambient effects have little presence in the rears. They have managed to get quite a bit of LFE out of the tracks though (especially the DTS one) and some of the more brutal punches and kicks have a very appropriately sound effect to accompany the action. The sound is all very clear and defined, with no muddiness or lack of fidelity. Of the three tracks the DTS 6.1 fares the strongest with the usual more dynamically rounded range, next comes the Cantonese Dolby Digital 5.1 which is slightly less pronounced than the DTS track. The DD5.1 English track fares the worst, simply for the fact of it being a very obvious dub, which proves too distracting to make the film enjoyable. Special Features: Hong Kong Legends have presented quite the wealth of extras for this Platinum Edition release. The commentary on Disc 1 consists of Bey Logan and Donnie Yen having a very informal banter for the duration of the movie. The commentary isn't exceptionally informative about the movie, but is entertaining as they cover many elements of the Hong Kong film industry and although they go off on many different tangents, they do remain very interesting. The existing friendhsip between Logan and Yen is prominent throughout, which makes for some great back and forth between them. Logan occassionally talks over Yen in excitement, but it dosen't get too out of control. They cover alot of ground in the commentary and although I wouldn't call it a"definitive Iron Monkey commentary" about its production and such, I would definitely call it one of the more entertaining commentaries around. Theres also an option to watch some of the commentary sequences with the film footage on the left of the screen and Bey Logan and Donnie Yen on the right side being filmed whilst doing their commentary.It dosen't add a lot, but its does show Logan's passion for Hong Kong cinema, the end portion of this is must see for comedy value alone. Disc 2 is the home of the bulk of the extras with four main sections on the disc. Interview Gallery: Four very interesting interviews with members of the cast and Tsui Hark, Iron Monkey's writer, and director of the Once Upon ATimeIn China series. Tsui Hark puts the story of Iron Monkey into perspective with the Once Upon A Time In china series. He goes into some great details about the production and his general feelings on movie making. A special note must go to the Sze-Man sang's interview. She provides a very entertaining insight to the experiences she had on the set as a child. The interviews all have their strong points and are all worth watching. The run time for each one is between 18 and 25 minutes and have all been conducted recently by HongKong Legends for this DVD release. Photo Gallery: These are bread and butter extras that are welcome, but not incredibly entertaining. Featurettes: Why these are in their own section when they all could have sat quite well in the interviews section, or had the other interviews in this section is a bit of a mystery to me. An interesting interview with Donnie Yen goes into detail about his thoughts on the movie industry, martial arts and asian culture. He has some very interesting opinions and he comes across as a rather colourful and personable actor. The second it an interview with Yuen Cheung-yan an elder statesmen of the stunts in kung fu movies who gives a lot of insight into the production side of the genre. Alex Yipp features in the third feature, showing some stunt work in his training gym and how fights sequences break down and are shot. I found this a bit of a missed opportunity as there isn't a voice over to accompany the action. Its still a welcome addition though. The fourth feature is one of the best on the disc as it is footage of Sze-Man Tsang and Fai Li from Iron Monkey in actual martial arts competitions from the 2003 Wu Shu Championships in Macau. Its great to see them in competing in their martial arts and really shows theirdedication to them. An excellent extra indeed. Information Library: Contains the usual filmographies of the main people involved in the prodction and the some other textual information regarding Iron Monkey's production. This rounds out a very impressive disc of extras that are as informative as they are entertaining. A very good example of how to do a great array of extras without repeating information too often. Final Say: This is right up there with the best Hong Kong kung fu action movies of all time. Amazing stunts and fights and a very entertaining story. It pulls no punches in being a true kung fu movie and won't change your opinion if you aren't a fan of the genre. If your a fan of the genre this is a must see DVD and if you're a fan of Tsui Hark's or Donnie Yen's work this is definitely must own. An impressive range of extras coupled with a brilliant transfer and great audio make this a wonderful DVD release of a very good kung fu movie.